I received an email from Lorrie for a baby shower photoshoot idea and I knew right away that I wanted to do it. With her vision and detailed planning, I was confident that the shoot would be successful. And in the end, it was even better than I could've imagined. 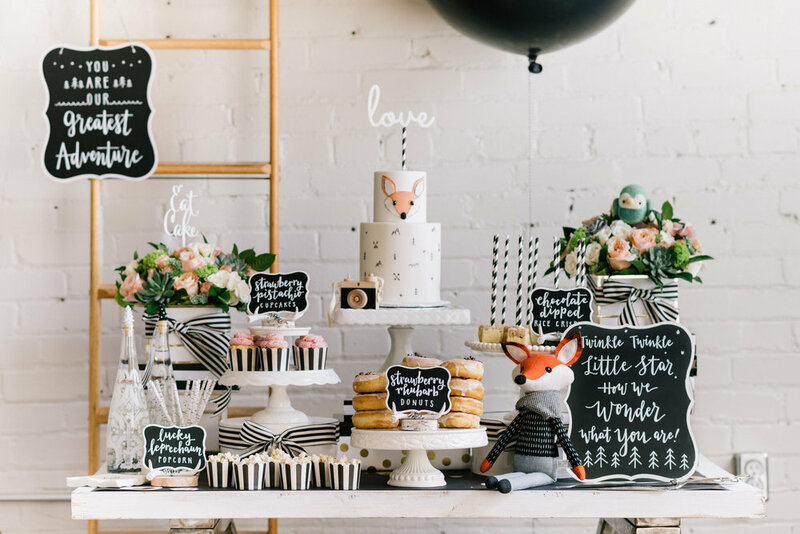 The theme was a Modern Wilderness baby shower and everyone contributed their craft to create something bigger together. Take a look for inspiration and check out each team member to see more of their amazing work. As a photographer, how could I not love this wooden camera by Little Rose and Co? Plus, you can actually press the shutter button! And this teepee by The Teepee Store is perfect for kids play or read in. The cutest ice cream teether by Sweetie Pie Design Co ready to go on a Toronto skyline tote by Gotamago. Hidden inside this wilderness-themed cake by Cakelaine is the baby's gender. The cute handmade wooden camera is made by Little Rose and Co.
Party favour bags by Creative Bag Co.